Archaeological evidence from the coastal zone of Accra dating back to the early Bronze Age (c. 4000 B.C. ), illustrates mostly fishing communities, inhabited areas surrounding the extensive lagoons and rivers. In the early sixteenth century, Africans and Europeans engaged in cross-cultural trade along the West African coast, trading commodities such as gold, ivory and gum Arabic. 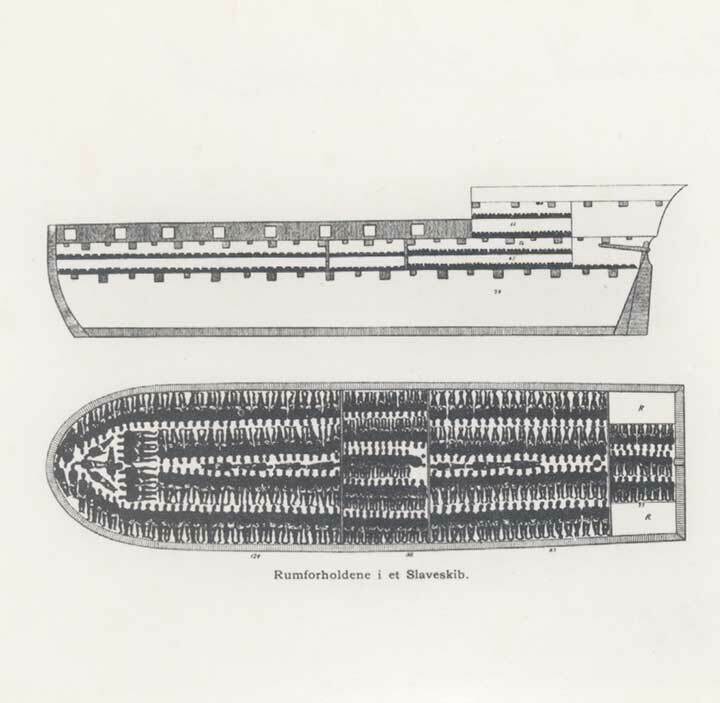 Still, with advances in new navigational shipping techniques and the establishment of plantation slavery in the Americas (present day United States, Caribbean and Latin America), the Portuguese, Dutch, Swedes, Danish and English promptly turned their attention to the trans-Atlantic slave trade. Between 1482 and 1786, approximately 80 castles, forts and lodges (or trading posts) were constructed, stretching along the 400-mile coastline between Keta and Beyin, formerly and notoriously known as the “Coast of Guinea” and “White Man’s Grave”. 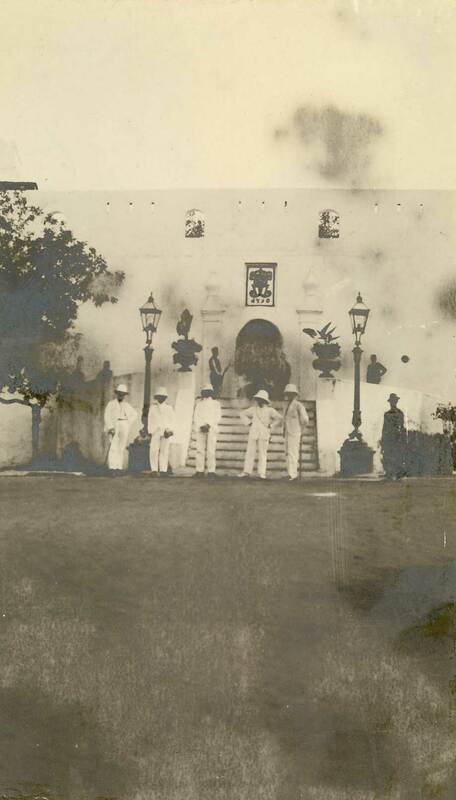 In Osu, Accra, Christiansborg Castle played a pivotal role, strategically situated at the intersection of important inland and trans-Atlantic trade routes. Christiansborg Castle was built by the Swedes in 1652, as a lodge used mostly for the storage of goods. In 1660, the Danes appropriated the site. Opportunities for trade bode well and the castle quickly became too small for Denmark’s trading needs. So in 1661, they purchased the land beneath the lodge from the paramount Chief of Accra for the sum of 100oz of gold. They built a fair sized stone fort and named it Christiansborg or Christian’s Fortress, after the reigning King of Denmark, Christian V. Measuring seventy-five feet square, the fort contained bastions projected twenty-five feet or more at each corner, a tower, twenty-four iron cannon and a few saluting guns. Over time, Christiansborg was enlarged and converted from a fort into a castle, to provide more storage and living space, as well as meeting the need for stronger defenses to compete with the Dutch and English coastal trade. With Denmark’s loss of Frederiksborg, near Cape Coast, the castle became the new Danish headquarters in 1685. In the following years, Christiansborg Castle along with nine other forts and lodges enabled Denmark to acquire a near monopoly of the trade on the west coast. This added enormously to the importance of the castle, and additions to the building were such that it quadrupled in size. In 1847 a large piece of ground was enclosed, extending along the entire north side of the fort and corresponding roughly with the present terrace. In these gardens the Presidential residence was subsequently built. An impregnable imperial fortification, Christiansborg Castle contained a courtyard, cistern, chapel, ‘mulatto school’, storerooms and living quarters, a gable containing a bell and tower and twenty-eight cannon. 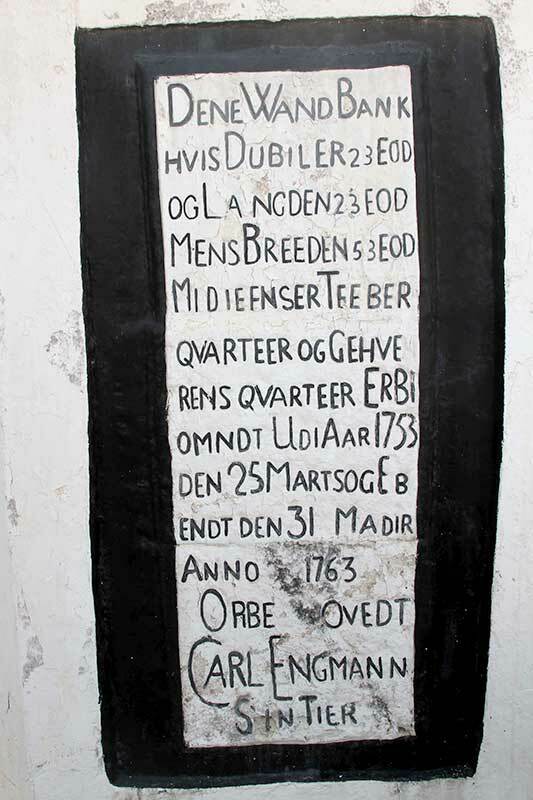 The cistern was inscribed with Danish Governor Carl Gustav Engmann’s name (1752-1757), and two structures bore inscriptions with the ciphers of Christian VI and Christian VII. A small room facing out to the sea served to bring in goods from the beach directly underneath. The castle contained up to as many as seven civilians, including a surgeon and chaplain, in addition to a garrison of thirty-three Danes and three hundred Africans auxiliaries. Denmark’s strength during this time was impressive. Between 1694 and 1803, the Danes conducted trade with Africans at the castle. The Danes purchased gold in exchange for flintlock guns, powder and bullets, liquor, cloth, iron knives and tools, brass bracelets and bowls, and glass beads. Enslaved Africans were sent to the Caribbean, notably, the Danish Virgin Islands (St. Croix, St. Johns and St. Thomas). In fact, Christiansborg Castle was so vital to Denmark’s economy that from 1688 until 1747, Danish ducats and double-ducats bore a view of the castle and the word ‘Christiansborg’. Apart from a few brief periods, the site remained occupied by the Danish. Between 1679 and 1683, it was sold and occupied by the Portuguese (renamed Fort Sao Francis Xavier), and between 1685 and 1689 it was remortgaged to the British. In 1693 Asameni, a powerful trader and chief from Akwamu, disguised himself and his men as merchants to gain entry into the fort and through this subterfuge, gained possession of Christiansborg. Asameni assumed the title of Governor and donned a Danish Governor’s official uniform. He finally sold the fort back to the Danes in 1694. However, the keys of the Castle were never returned and to this day are part of the stool property of Akwamu. The Danish Edict of 16 th March 1792 officially marked the end of the Danish trans-Atlantic slave trade, though it was not enforced until 1803. However, this ten-year period of ‘adjustment’ meant that the Danes claimed to be the first nation to abolish the trans-Atlantic slave trade. With Denmark’s loss of Norway to Sweden from 1814 onwards, the country faced unprecedented financial difficulties, yet was reluctant to give up its territories. However, in 1849, Denmark sold Christiansborg Castle to the British for £10,000 (as well as forts Augustaborg, Fredensborg, Kongensten, Prinsensten and Prøvesten, and the plantations in the Akuapem Mountains). In 1862, Christiansborg Castle was severely damaged by an earthquake, and two of the upper floors collapsed. These were reconstructed and in 1873, the castle became the British seat of colonial government in the Gold Coast. After 1876, British colonial Governors resided in the castle but abandoned it between 1890 and 1901. During that period it functioned as a constabulary mess and then as a lunatic asylum. In 1902, it reverted to the seat of government under colonial British rule. With Ghana’s independence from Britain in 1957, Christiansborg Castle was renamed Government House. In 1960, Kwame Nkrumah was appointed the first President and Head of State. The castle continued as the seat of government and also served as the President’s official residence. President Flt. Lt. Jerry John Rawlings continued this arrangement. But in 2009, President Kuffour moved the seat of government into what is now known as Flagstaff House, because he felt it was inappropriate for the seat of government to be located in a building so closely identified with the trans-Atlantic slave trade. But, President John Atta Mills subsequently reversed this decision later that year. However, in 2013 the seat of government and the official residence moved back to Flagstaff House under President John Dramani Mahama. Today, Christiansborg Castle is protected as a National Monument under the National Liberation Council Decree (N.L.C.D) 387 of 1969 and Executive Instrument (E.I) 29 of 1973. Due to Christiansborg Castle’s continued occupation as Ghana’s seat of government, no archaeological research has been conducted. But in 1960, Cabinet Secretariat building reconstruction by the Public Works Department discovered English clay and local smoking pipes, a small decorated gold-dust pot, an elaborate silver horn ornament, State swords, a groundnut, European knives, local and European bead necklaces. These findings are currently housed in the National Museum. In 2014, the Christiansborg Archaeological Heritage Project was given permission to begin archaeological investigations at the site. To date, we have excavated an extensive pre-colonial settlement. This includes the foundations of houses and what is tentatively thought to be a kitchen since it contains three stones (for balancing a cooking pot) and charcoal, in keeping with local cooking area design. We have also retrieved a large collection of local and foreign manufactured objects obtained through the transatlantic trade. We have identified what are commonly known as “African trade beads” that were produced in other parts of Africa, as well as Europe, including Italy and Holland. Ceramics include Chinese and European ceramics (Wedgewood and Royal Doulton), alongside local pottery. An African smoking pipe and numerous Dutch, English, German and Danish clay smoking pipes were recovered from the site. European glassware ranges from every day usage to refined, luxury ware. There are a number of other small finds including a slate fragment, typically used for writing, as well as faunal remains, seeds, metals, stone, daub, cowrie and other shells. With the assistance of local fishermen, we even excavated a canon immersed in sand that had fallen from the castle above down on to the beach below! Under the castle, we also discovered the entrance to an underground tunnel that led to the nearby Richter House, formerly owned by a successful ‘mulatto’ Danish-Ga trader. The excavated artefact collection will contribute to the plans to develop the castle into a museum.